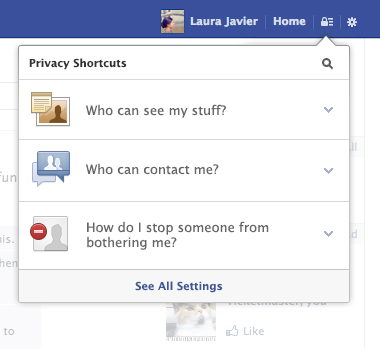 In a somewhat surprising move, Facebook has changed its privacy settings once again. There are several new additions, including a shortcut to privacy settings, significantly more detailed messages about those privacy settings, and a revamped Activity Log and photo tagging feature. All of the changes will go into effect at the end of the year. The new privacy shortcut feature will make it easier for users to select who can and can’t see their profiles, and also make it easier for users to block other users with the click of just one button. “There are a billion users and blocking is the ultimate way of saying I don’t want to interact with this person,” said Sam Lessin, Facebook’s director of product, in an interview with The New York Times. “We think blocking is really positive.” However, Facebook will also do away with users’ ability to block themselves from being found via search on the site. The new photo feature will allow you to use Facebook pictures to find all tagged pictures of yourself on the site, as well as see what groups of people the pictures are visible to. You can then select a batch of them and untag yourself, or even send a form letter to the person who put it up asking him or her to take it down. The new app feature will also boost users’ privacy by requiring apps to ask for explicit permission to post content on users’ walls. Outside of taking away users’ right to not be found via Facebook search, the new features seem like an overwhelming victory for individuals’ privacy and control on the site. What do you think about these changes going into effect at the end of the year? What else would you like to see Facebook change? For complete details on the upcoming changes, check out this post in the Facebook Newsroom.